Parranda: A Musical Tradition from Puerto Rico - Puerto Rico is Music! Puerto Rican culture shines brightest during the holiday season. Lasting from the end of November through the end of January, there are many Christmas traditions that are unique to the island. One of our favorite traditions is the Parranda. Parrandas are the Puerto Rican version of caroling. It is marked by singing traditional Puerto Rican music called aguinaldos (Christmas Songs) and using traditional instruments, including Guitars and Cuatros, tambourines, maracas, palitos, and guiros. How does a Parranda Work in Puerto Rico? A small group of people (parranderos) get the party started by surprising a friend at their house with music from Puerto Rico. Once the musicians have congregated on someone’s porch, they begin an asalto navideño, or a Christmas assault. This song awakens and greets the homeowner who must come to the door and let the musicians in. The musicians squeeze into the house and continue to perform aguinaldos. They usually get started after 10pm so that one is awoken in surprise. Then, as a group, they continue to the next house. Each house visit grows bigger through the night as more neighbors join in. The parrenderos are usually plied with drinks and food, and perhaps a little homemade coquito (Puerto Rico’s version of eggnog) and then on to the next house. Usually, things wrap up around daybreak, with the last house usually providing something heartier like an asopao, or stew. What is sung at a parranda? Music is a particularly important aspect of Christmas in Puerto Rico. The aguinaldo provides the basis for much of the music that accompanies the parranda. Although the word aguinaldo in Puerto Rican Spanish, means “gift,” it also refers to a Christmas song,. This use of the word equates the playing of Christmas songs with the giving of gifts. And if sung well, it is indeed! 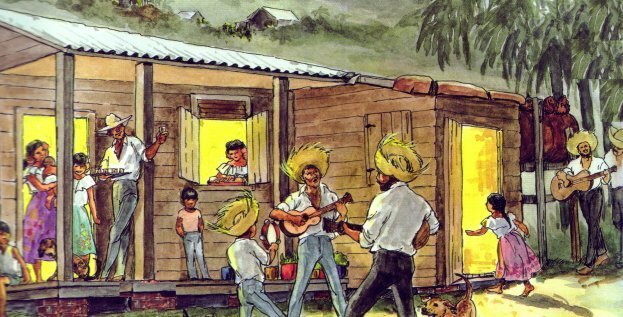 Parrandas: A Puerto Rican Music Christmas Tradition was written by Captain Tim and posted in the Caribbean Trading Company, where you can find products from the Caribbean, including Puerto RIco books, treats. coffee, jams. Imagine a traditional store in Old San Juan, but online. How does a Bomba session work? 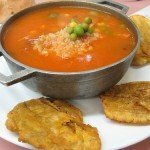 Interested in knowing why the Bomba ay que rica es?